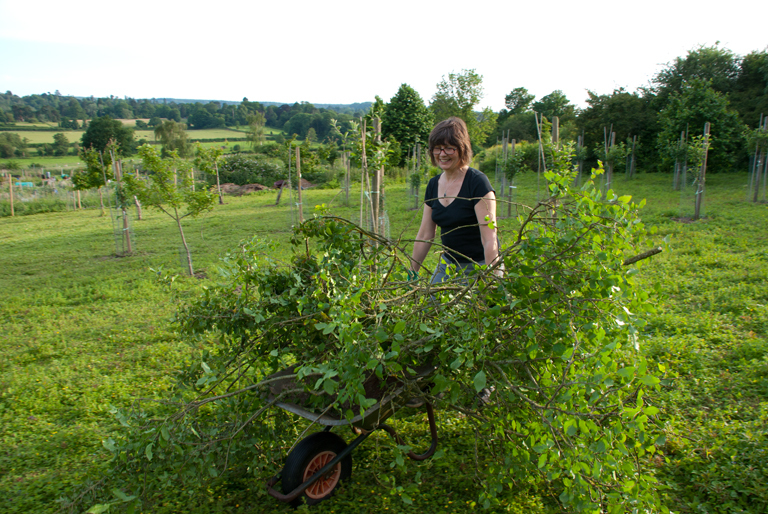 I visited the Dorking Community Orchard on Monday evening to find out a bit more about it and to meet up with Eleanor Lines who volunteers there. Eleanor is the Editor of a free local magazine called Families (Surrey East) and I met her at the Petersham Nurseries preview evening I attended back in early May. 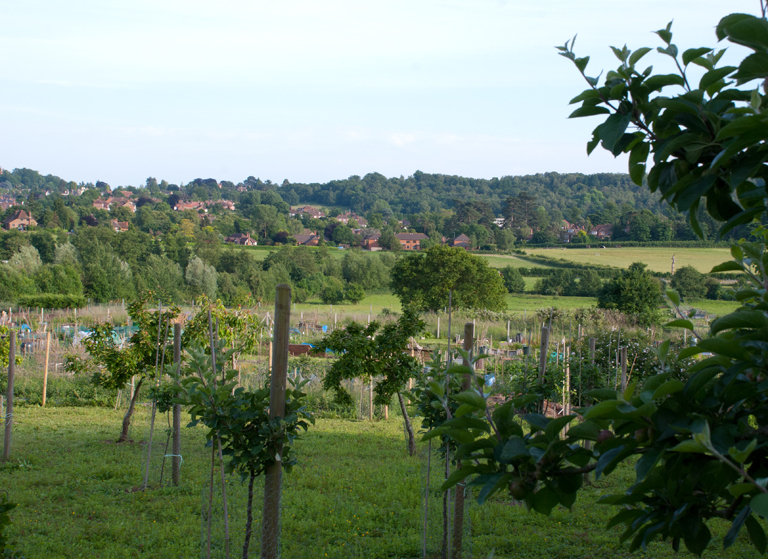 What a truly wonderful place the orchard is too – on the outskirts of Dorking town overlooking the Surrey Hills. It was peaceful and the sun was shining, it was really idyllic. 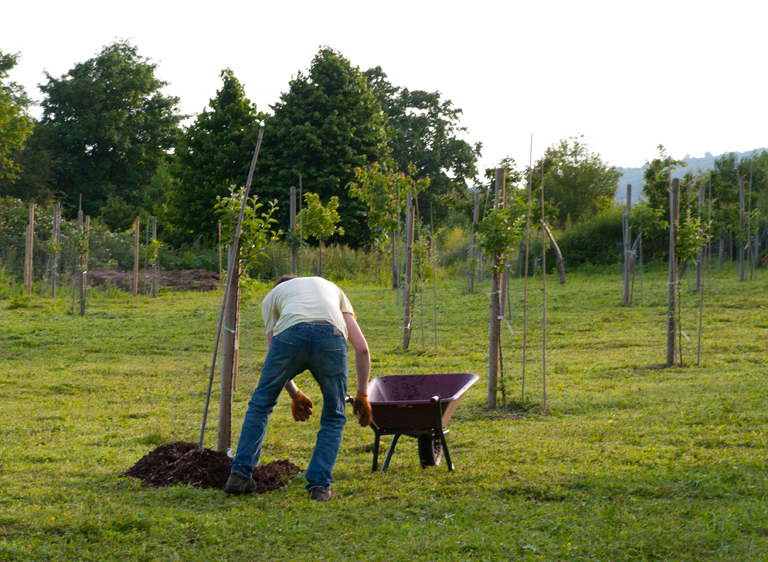 The Orchard was set up in the Autumn of 2009 to help to teach people in the community how to plant, establish and manage fruit trees. 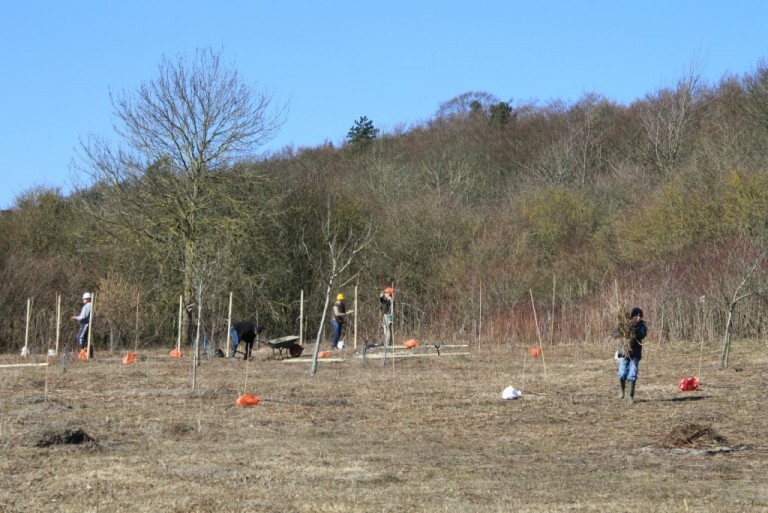 The first 36 trees were planted in 2012 and the programme of planting will continue over the next few years as and when funding is available. They plan to plant over 100 trees eventually. Originally the site was part of the Millenium Arboretum but many of the trees planted in 1999/2000 have died through neglect. 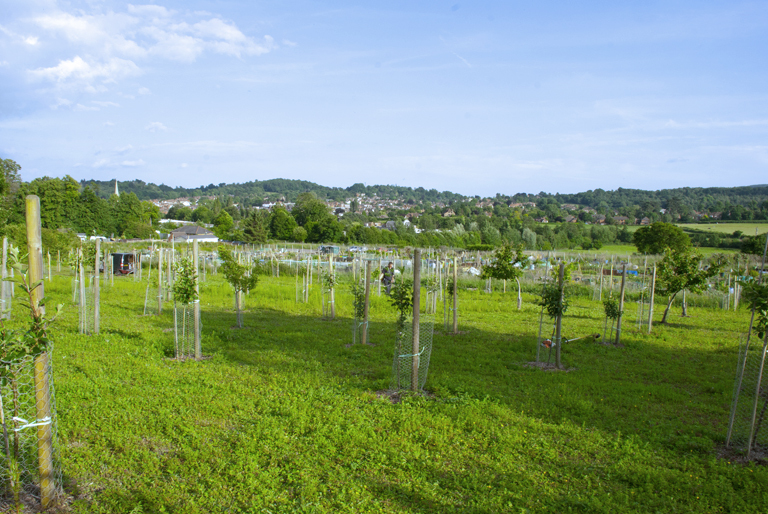 Those remaining trees have been incorporated into the new orchard where in total there are now more than 20 varieties ranging from plums to apples and pears. Quite different to how it looks now don’t you think!? 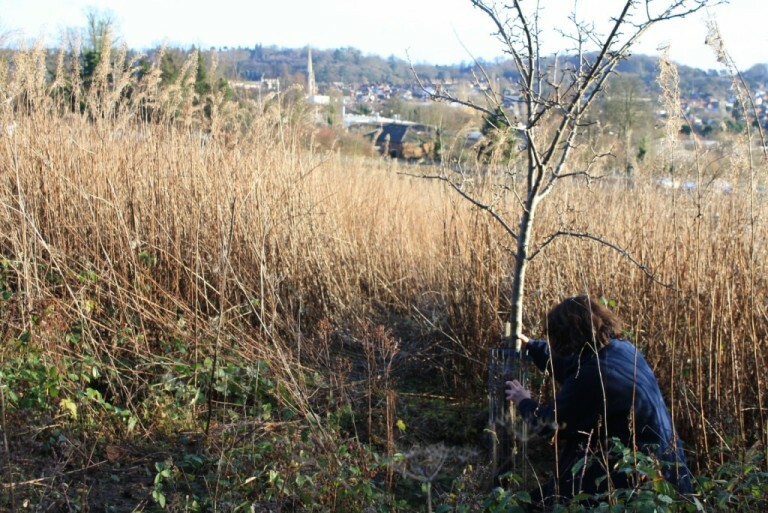 The land is leased from Mole Valley District Council and receives financial support from the Orchid Trust and Community Foundation for Surrey, the Local Committee of Surrey County Council, and the contributions of Friends of the orchard. It’s free and open to the public and any fruit produced is free for picking. 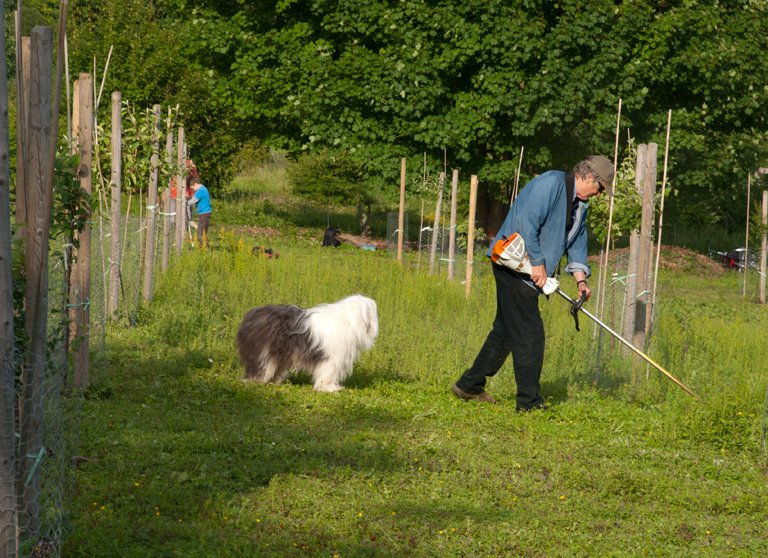 The upkeep and ongoing development of the site is very much in the hands of the volunteers who spend time weeding, mulching and pruning. Monday evening was one of the work nights and these take place every other Monday evening (weather dependent) and one Saturday a month. These work evenings are open to anyone who wants to help, including children as long as they are accompanied by an adult. For more information about the project and its plans for the future, do go and check out their website. They also run workshops and the next is a ‘Propogation by budding’ workshop on Sunday 22nd July. Alternatively you may wish to join them for one of the work evenings, details of which can be found here. And if you don’t fancy getting your hands dirty, but want to support the cause, you can make a donation here.